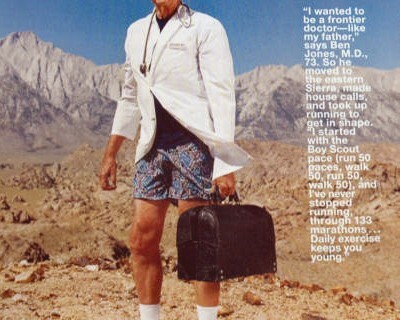 Ben Jones, M.D., has birthed more than 1,000 babies, performed 2,000 autopsies, and run 133 marathons in his 73 years. He’s learned some lessons about living the best life along the journey. In 1963, fresh from a 3-year medical residency, 30-year old Ben Jones hiked to the summit of Mount Baldy and, looking out over the smog engulfing Los Angeles, tried to envision his future in the booming city below. He moved to Lone Pine, California, between Mt. Whitney, the highest peak in the lower 48, and Death Valley, the lowest point in North America (actually the Western Hemisphere). Population: 1,655. Stoplights: 1. He made house calls. For 43 years, up until retirement last summer, he made them in a Model A Ford, a Datsun 280 ZX Turbo, (during his wilder days), by motorcycle, by bicycle, and in a Cessna 205 he piloted to see patients in Death Valley. Jones says he became woefully out of shape in mid career. Badwater Ben knows a lot about the desert and the mountains, about life and death, about career struggles, and the stress that ravages working men. (He suffered from clinical depression until he found relief through shock therapy when antidepressant pills didn’t work.) And he’ll tell you about it all, if you’re buying coffee. One of the smartest things you can do is pull off the road when you are tired, and take a nap. Exercise first thing in the morning, before the excuses creep in. I did a marathon a month for years. I found that if you schedule a bunch of races, you don’t have to train for them; you’re always maintaining your fitness just by racing. Look at your feet. I tell my patients, Let me see your shoes. People wear terribly hard soles. Soft is better. Go to a running store and get orthotics. Take care of your feet; they’ll take care of you. I’ve tried all the diets. They’re mostly crap. There is no way you can gain weight if you burn off the same amount you are eating. So I translate my food into the amount of exercise I need to do to get rid of the glucose that’s in my blood stream so it doesn’t have to turn into glycogen for storage in my muscles and liver. To me, that’s the commonsense way. If you exercise enough, you can eat almost whatever you want three times a day. Why do we make this so complicated? Quiet is underrated for good health. I love a world of silence. When I watch TV, I use closed captioning. You should try it. People overmedicate when they get sick. They rely too much on the over-the-counter stuff. You don’t need it. Just go out and breathe some fresh air. Be active. Take vitamins. Go to bed early. Drink fluids. I never took an aspirin or anti-inflammatory (pills) to treat pain from exercise. If you are in pain, something’s wrong. Exercise shouldn’t hurt. I never lit a cigarette. I can’t shed a tear for someone who dies of lung cancer. They brought it on themselves. A smoker’s lung looks as black as a coal miner’s. And that’s a fact. Depression isn’t your fault. Understanding that helps a lot. Knowing when to give something up works better than a .38-caliber to the brain. Can’t find time to exercise? Put an elliptical machine in front of your TV set. Remember how they used to put a governor on a car so it wouldn’t go too fast? When I run, I purposely don’t breathe through my mouth—just my nose. That’s my governor. If I have to open my mouth to breathe, I know I’m going too fast and I’ll poop out sooner. If you have a lot of outside interests, then you won’t be so reliant on your job for self-esteem. I try to be behind an 18-wheeler when I drive, so I won’t be wiped out in a head-on. Do you know what wealth is? It’s you friends and you family period. The saddest part about dying is that all the stuff you’ve learned goes into the ground with you. Make sure you pass it on before you croak.